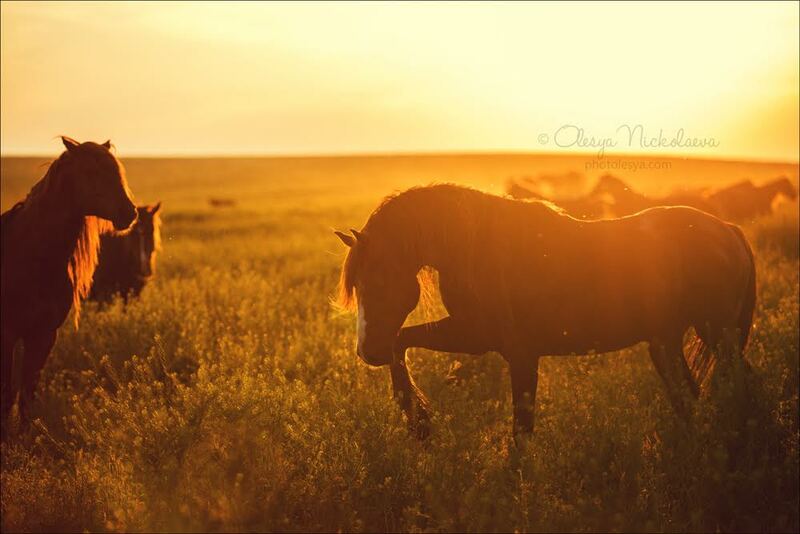 We managed to reach the only spot in Russia that has been sheltering a herd of wild mustangs for several decades. An island lies in the middle of a great lake. Its steppes are covered in patterns left by dozens of hooves. The island's only inhabitants and righteous owners are wild horses. As they gallop to their watering place, the dust rolls and the earth trembles, just like in ancient Russian tales. These mustangs have lived on the island for many years and humans do not infringe on their independence. The juxtaposition of Kalmykian steppes and deserts with the Stavropol Territory and the Rostov Region is marked by the salt Lake Manych-Gudilo. It is located in the middle of a trench marking the border between Europe and Asia – right on the edge of two cultural frontiers. For locals, Manych-Gudilo is a local version of the Dead Sea. At night, a distant humming can be heard in the vicinity of the lake. Tourists come here not only to listen to mysterious sounds, to learn of the locality's history and gaze at picturesque sceneries: the principal tourist attraction of this area is Vodny Island, the home of wild horses. Up until the middle of the last century, there was a farm on the island, but at some point it was deemed unprofitable and was closed down. However, a few horses ran away into the steppe, thus becoming ancestors of the present herd. Another version has it that horses were brought to Vodny Island for the shooting of a Soviet western-style movie called The Seventh Bullet, but the horses got scared of the shots and dispersed across the vast island. The least realistic legend suggests that Batu Khan, the Mongol ruler who raided ancient Russia, hid treasure on the island and left some of his best stallions to guard it. As you can see you have many options to believe in, but you could just ask the island keeper who will accompany you during your rendezvous among the mustangs what he thinks. Breaking out into the wild, the horses quite soon recovered their ancestors' ways prior to being domesticated. The huge herd divided into a few small harems that resemble human families: a horse with a colt and the colt's father, a stallion, who protects his near and dear. In larger groups the leader stallion could be compared to a sultan who has to fight for concubines with his rivals. There are also bachelor clubs, comprised of young males who haven't yet acquired enough strength and experience to start a family of their own. Despite the rivalry between stallions, the general atmosphere in the herd is peaceful, with horses moving around together and coming to the watering place in organized groups. The Vodny Island mustangs have longer manes than their domestic counterparts, sturdier builds and a more intimidating posture. If you take a closer look at some stallions, you will see wounds and missing flocks of wool – the consequences of fierce battles over females. For the most part it is the males' muzzles that bear scars: during fights they rear up and try to bite their adversaries, while kicking them with their front legs. As for females, they have scars on their croups: if a female horse strides too far from its harem, its spouse will give it a cautionary bite. The horses pasture peacefully for most of the day. But when they dash across the field in the rays of the setting sun, like red, pitch-black and chestnut waves, spreading the rhythmic clatter of hooves for miles around, you cannot but feel that you are in a faraway world untouched by civilization. Many generations of island mustangs are oblivious to the existence of saddles, reins and spurs. No sticks – only carrots, which are sometimes supplied by tourists. The horses don't see many humans. They show no aggression toward us two-legged folk and could even be considered friendly. Some of them will take a treat from your hands and let you pat their manes. Only herd leaders might squint at you suspiciously, digging the ground with their hooves to intimidate you. The herd of wild horses is also remarkable for the fact that the entire population survives almost without any human intervention: In summer, horses pasture on the grass, and in winter, they manage to find food under the snow. However, people intervened on the issue of fresh water on the island, placing the herd under UNESCO protection and providing the horses with running water and drinking troughs. Lake Manych-Gudilo and the adjacent territory have been included in the Rostov Nature Preserve. Vodny Island is neighbored by a small island called Ptichy Island (Birds' Island). Every year is attracts flocks of rare birds, such as small egrets, mute swans, Caspian gulls and Dalmatian pelicans. The Island of Tulips is open for guided tours in May and June – that's when the buds burst open.